On a sunlit shore, seemingly nowhere in particular, framed by palms and blue skies, within thatched enclosures, lulled by the continual boom and ebb of waves, there is a little hub of passion and devotion where little babies struggle to survive and grizzled men lovingly tend to the wounded, the resting and the trusting. 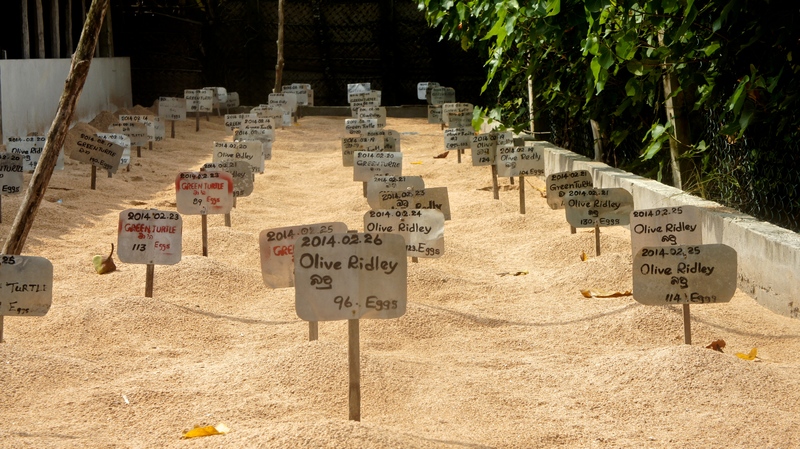 This is the Kosgoda Turtle Conservation Centre, a serendipitous discovery beside our home for three days – Saffron and Blue – in Kosgoda, along the south western coast of Sri Lanka. The Centre was set up in 1978, funded by financial contributions from a few people including Victor Hasselblad (of the world-famous Hasselblad camera fame). 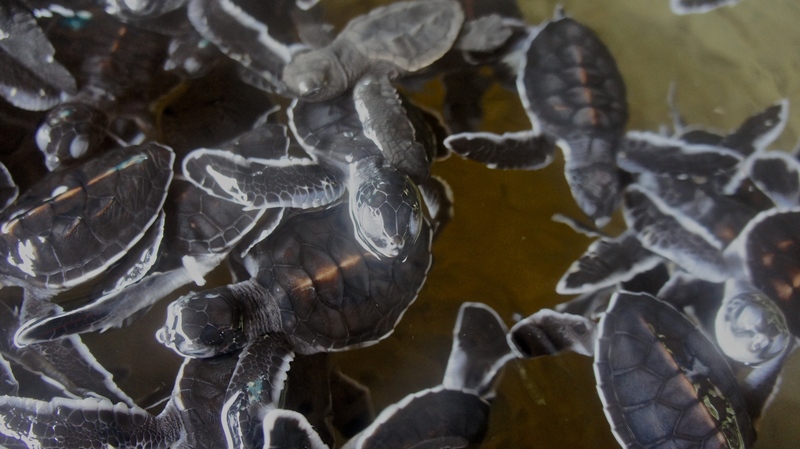 The initiative to protect and safeguard sea turtles began for the first time in Sri Lanka – both timely and necessary as five of the eight species in the world are found on this island. Olive Ridley, Leatherback, Hawksbill, Green and Loggerhead turtles have long used these beaches as nesting grounds, the females laying about 80 to 120 eggs in several clutches each season. 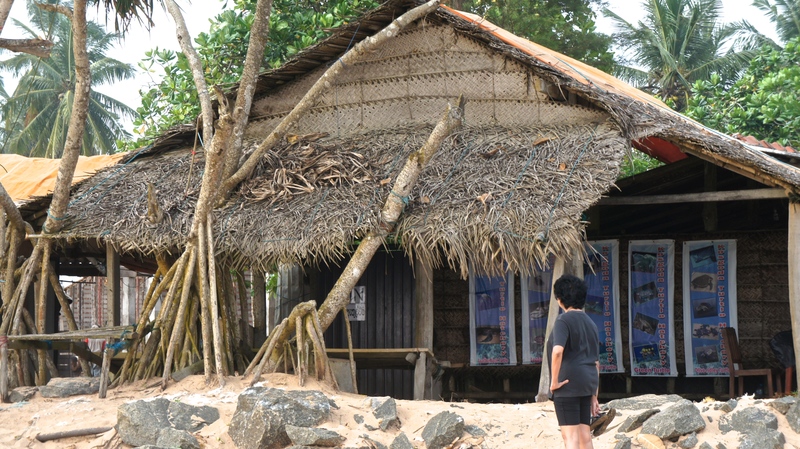 The females travel long distances, many miles over many years, returning to the same beach where they were born, even though decades have passed and the beaches themselves may have greatly changed through natural disasters (the 2004 tsunami, in this particular case) or ‘economic progress’ – tourism, construction, electrification, erosion. These huge reptiles (yes, reptiles – they are cold blooded, have no hair and produce no milk for their young) crawl up the beach and using their flippers, proceed to dig a pit to accommodate their size. They dig further to create a nest for their eggs. 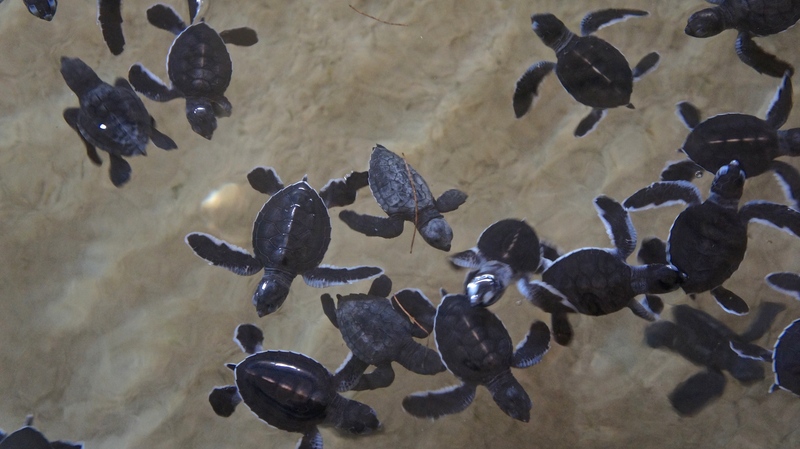 Once these have been laid, the turtles use their hind flippers to tamp the sand back down over the eggs and the mothers return to the ocean in the belief that their babies are safe. Before the hatcheries began operating, fishermen used to dig up the eggs in the mistaken belief that consuming them would contribute to longevity of life. 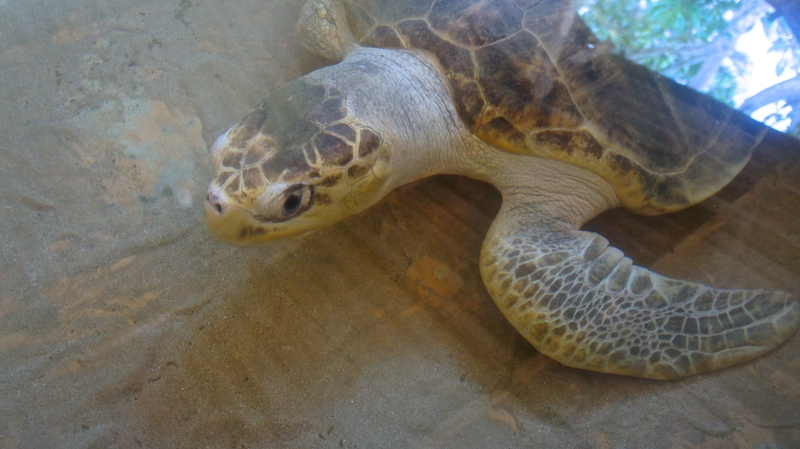 (A sea turtle’s estimated life span is about eighty years). Our voluble, passion-fueled and erudite guide-with-a-missing-finger turned a tad sardonic. They did not realize that the eggs are very high in cholesterol, so, in time, they keeled over and died, he remarked. 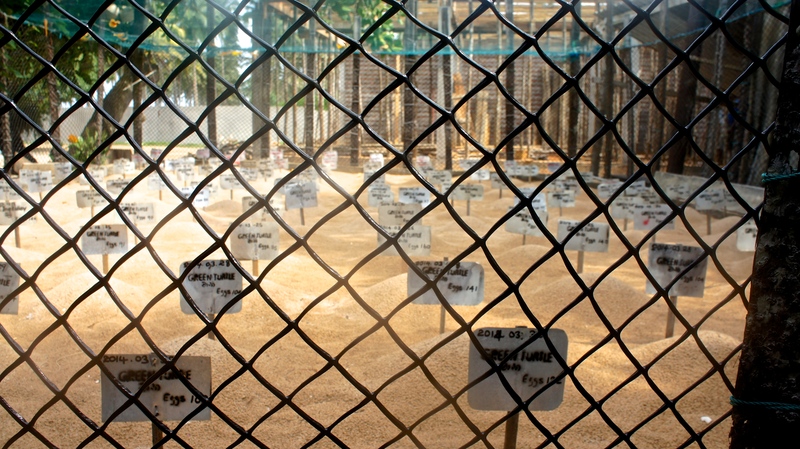 The hatchery today purchases eggs from the fishermen at 20 Sri Lankan rupees each, sorts them according to size and type, and buries them in sand pits for the period of their incubation (45 to 70 days) which is affected by the temperature of the hand-dug sand nests in which the eggs are buried. Warmer temperatures mean a quicker hatching of the eggs. 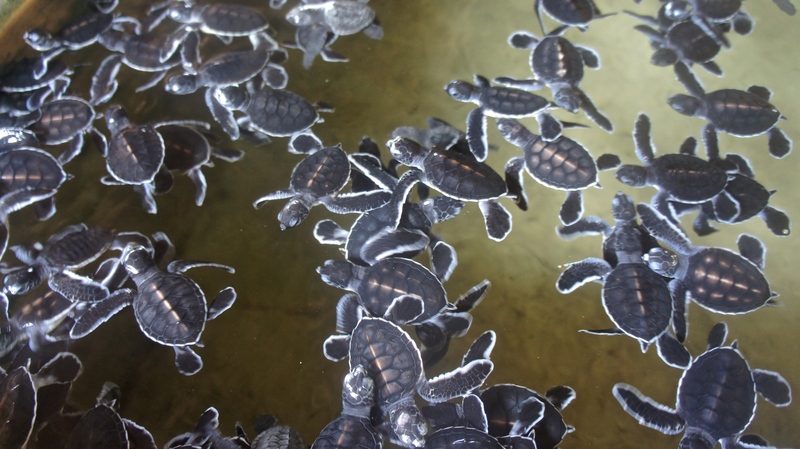 Interestingly, temperature also determines the gender of the hatchling : cooler temperatures favoring males and warmer ones, females. 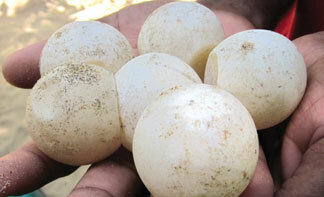 The position of the egg within its nest additionally affects gender – females in the center, males towards the perimeter ! In the ideal, natural situation, the eggs hatch and the hatchlings head for the sea. In the hatcheries, however, the babies are guided by the light of a bare bulb (which they mistake for moonlight, their ‘lunar beacon’) into concrete incubator tanks filled with sea water. The little ‘turtlings’, belly buttons open, eyes closed (according to our guide) move from tank to tank for the first three days till their belly buttons close and their eyes open. This is the period of their juvenile frenzy – where they swim non-stop for a couple of days, sans any kind of nourishment, save the energy within their little bodies. It is fascinating to watch, and like all babies in playpens, they are full of buzz and excitement, innocent and seeking, swarming towards the tourist, the child, the observer. 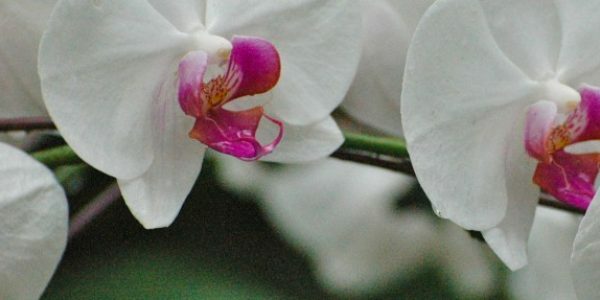 Their joy at being alive (or is it fanciful anthropomorphizing ? ) is infectious, it is humbling, it is absorbing – this exuberance of tumbling, flapping and clambering. In three days, it is time for them to leave, head for the open seas. 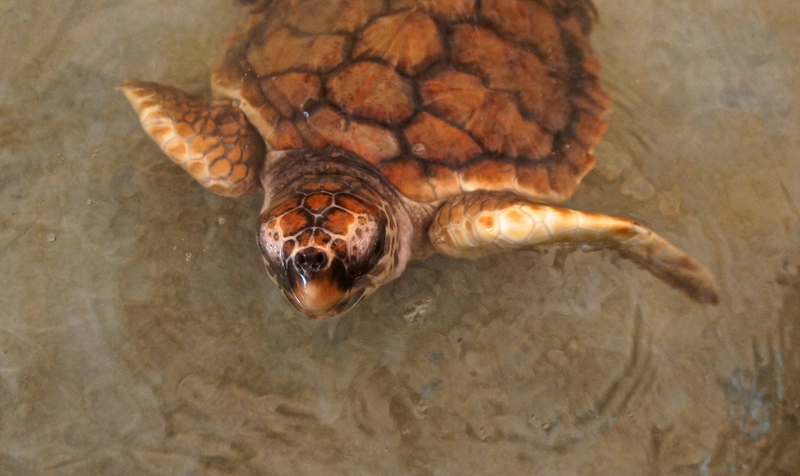 The babies are released past dusk or at different times of the night, from different parts of the beach to maximize their chances of survival. 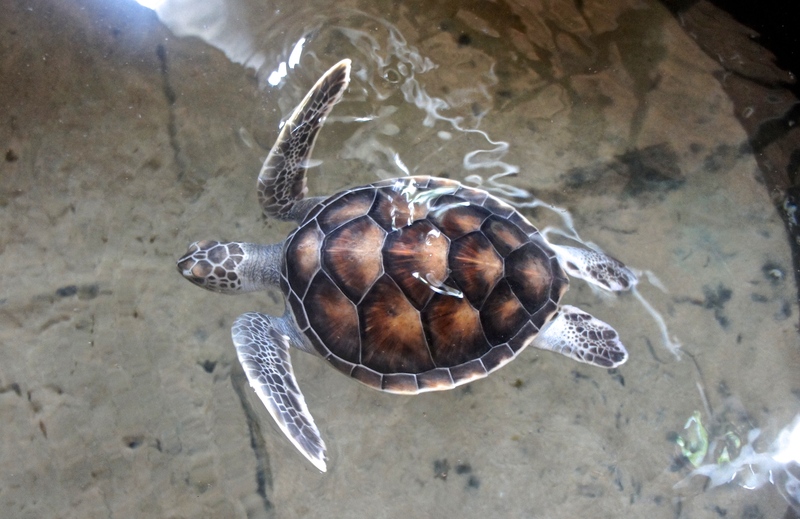 Because the predators are watching : the likes of hawks, eagles, kites, barracuda and tuna frequent the areas where the ‘turtlings’ are normally released, and moving the location each time gives the hatchlings a fighting chance. A sense of place and belonging. And because the females return to the beaches where they were born during their nesting season – whichever part of the world they are in, and however long it might take them – the babies are released from the shore and not from a boat, to ensure their sense of location and identity. The hatchery is not just a conservation center, it also rehabilitates wounded veterans, albinos (though rare), the maimed and the deformed. 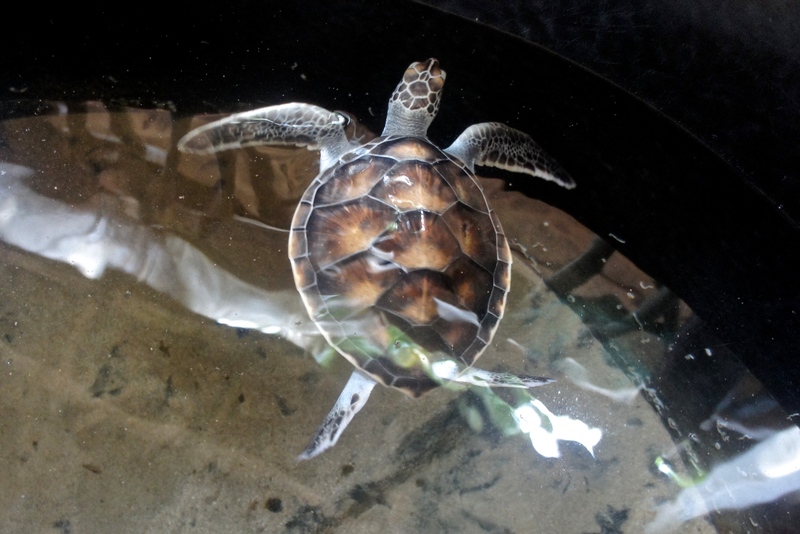 These disadvantaged turtles – limbs missing, blind, hapless – have a home here for as long as they need it, perhaps even for life, cared for by dedicated volunteers and veterinarians from nearby Galle. 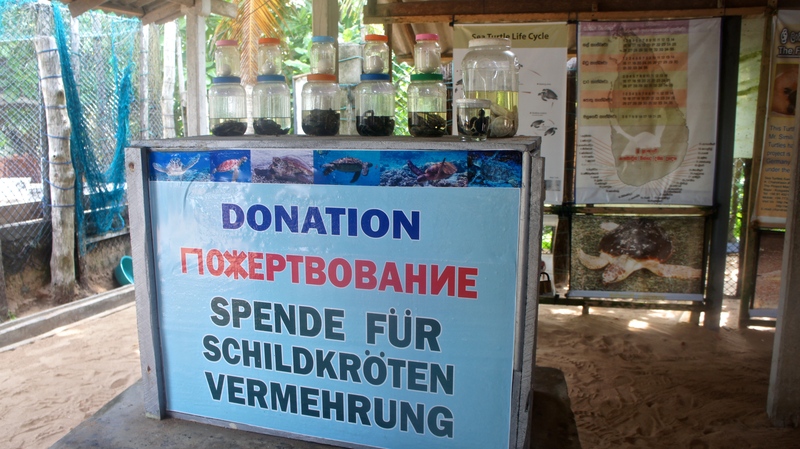 The hatchery has no government funding ; it operates solely on private and tourist donations which go towards construction, repair and maintenance of tanks, pumps, cleaning, food for the reptiles and more. (The 2004 tsunami completely decimated the hatchery). 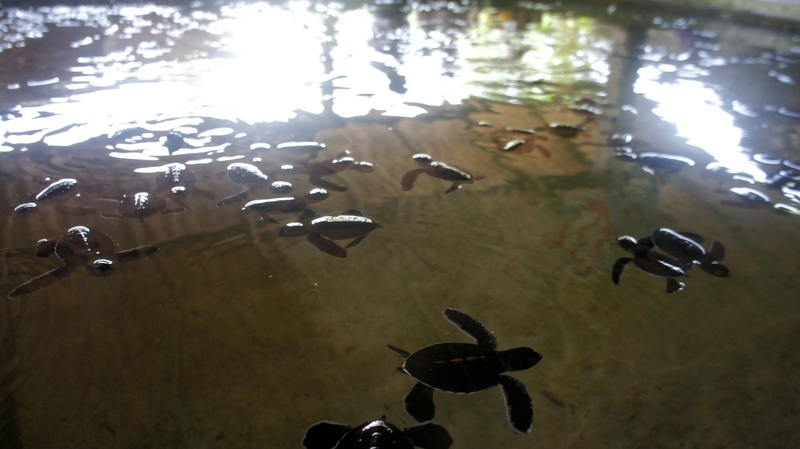 It is estimated that over four million turtle hatchlings born at the Kosgoda Turtle Conservation Centre have been released so far into the sea. 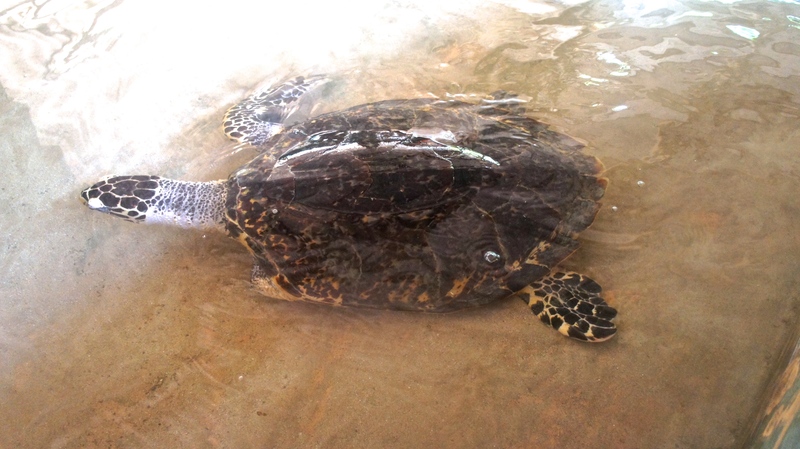 The consumption of turtle meat is banned in Sri Lanka, unlike in other parts of Asia, much to the disappointment of some tourists (said our guide) who visit the hatchery and then inquire where they can have some turtle soup ! We are immeasurably affected by this serendipitous visit, this microcosm of creation, existence, survival, care, helplessness and dependence. Keats expressed it perfectly when he wrote the poetry of the world is never dead.